I read this article and found it very interesting, thought it might be something for you. The article is called Child Labour Drops 60% In A Decade But Still World’s Highest and is located at https://archive.indiaspend.com/investigations/child-labour-drops-60-in-a-decade-but-still-worlds-highest-64501. 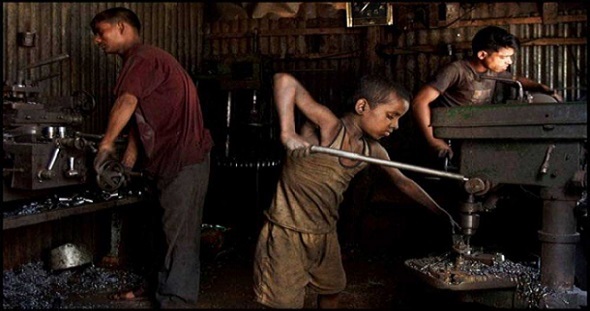 India’s Child Labour (Prohibition & Regulation) Act, 1986 prohibits children under the age of 14 from working in hazardous processes/occupations. And yet, according to the 2001 Census, a staggering 12.6 million children between the ages of 5-14 years were working in India. That’s changing. In what appears to be a fairly sharp improvement, data (from the National Sample Survey Organisation for 2009-2010) now puts the number of working children at 4.9 million, a 60% reduction since 2001. An amendment to the 1986 Act was introduced in the Rajya Sabha on December 4, 2012, and is pending before the House. The bill seeks to impose a blanket prohibition on children under the age of 14 from working, except in case of work for family after school hours.The amendment is in keeping with the Right to Education Act, which seeks compulsory education for children between the ages 6-14 years. According to a report titled “Children in India 2012 – A Statistical Appraisal”, released by the Ministry of Statistics and Programme Implementation (MOSPI), India has the largest number of child labourers (under-14 years of age) in the world. The Census 2001 also found that nearly 85% of child labourers are hard–to–reach, invisible and excluded population as they work largely in the unorganized sector, both rural and urban, within the family or in household–based units. The major occupations involving child labour are pan, bidi and cigarettes (21%), construction (17%), and spinning & weaving (11%), which qualify as hazardous processes/occupations. Domestic workers constitute 15% of the total child workers. Uttar Pradesh has an estimated 1.7 million children working in various sectors. West Bengal and Rajasthan also show high numbers, although the estimated number of working children in UP is three times that of West Bengal. Rural male children in the age group of 5-14 constitute 50% of children working across the country while rural females constitute 35% of children working across the country. In Bihar, over 81% of children working are rural males while in Jharkhand, 77% of children working are rural males. In Tamil Nadu, 80% of the children working are rural females. Generally speaking, children in urban areas are better off when it comes to child labour. Rural children constitute 85% of the children working in the country – indicating a wide gap in education and child rights between rural and urban India. The highest decline in terms of percentage is of Chhattisgarh and Tamil Nadu where child labour dropped by 97% & 96%, respectively. U.P saw the least decrease in numbers (7.9%) since 2001.The decrease in number of children working is an encouraging sign, and suggests the effectiveness of the schemes (direct or indirect like focus on primary school enrollment) implemented by the Government. Though other reasons including social awareness and economic growth could also be playing a role. The National Child Labour Project (NCLP) along with Grant–in–Aid (GIA) are the schemes aimed at rehabilitating child labourers. The programmes are being implemented since 1988. The schemes hope to rehabilitate children withdrawn from working in hazardous occupations/ processes into the formal educational system. The Government released Rs 137.43 crore as grant for NCLP for the year 2011-12. The states of Uttar Pradesh, West Bengal, Bihar, Orissa and Andhra Pradesh have been the biggest beneficiaries of these funds. Over 0.4 million children have been mainstreamed under the NCLP scheme since 2009. Of this, the maximum number of children (0.1 million) rehabilitated are from Uttar Pradesh. But the performance of the scheme in West Bengal is not as effective. West Bengal receives almost twice the amount of funds (Rs. 93.7 crore) under the scheme than states like Madhya Pradesh (Rs. 50.4 crore)and Andhra Pradesh (Rs. 55.1 crore). And when we compare the number of children mainstreamed under the scheme, West Bengal has rehabilitated only 25,975 children while Orissa (48,506) has almost twice the numbers and Madhya Pradesh (45,669) and AP (36,589) are doing a better job. Punjab had the highest number of inspections (9,936) under the Child Labour (Prohibition & Regulation) Act , 1986 in 2012. It also had the highest number of convictions at 159 followed by U.P with 156 under the Act. Child labour is a deep-rooted problem as it denies the child his/her basic right to education. This, in turn, leads to unskilled adult labour force, which causes early physical decay, economic insecurity, low quality of life and ultimately high poverty. Child labour is a vicious circle of poverty, unemployment, underemployment and low wages. Over the years, the Government has multiplied its efforts to address the needs and rights of exploited children. The Government grants being released under NCLP have also seen a significant increase, which is translating to a higher number of rehabilitated children joining formal education in most major states. However, the high number of children working (4.9 million) is still worryingly high. Something that should bother not just policy makers but also well-meaning parents everywhere. Kudos to the Author of this article for such thorough research and analysis on such a pressing issue at hand. It can only be hoped that the relevant authorities consider data like this while devising policies to effective tackle the malaise that child labour is. However, we must be aware that we are responsible, that we are the change for better or worse!